As you might have noticed, I am a bit of a Disney freak! While I was 23 the first time I was able to make it to Disney World (and I still haven’t been able to afford a trip to Disneyland), I own an extensive library of Disney movies! One of my all-time favorite Disney movies, The Jungle Book, just released a Diamond Edition Blu-ray Combo pack! I received a copy courtesy of Walt Disney Pictures for the purpose of this review, but obviously, I would have bought it anyway! This is the first time that The Jungle Book has been available on Blu-ray digital high definition! I always find it a bit difficult to write reviews of the classic Disney animated movies, because what could I tell you about Disney’s The Jungle Book Diamond Edition Blu-ray that you didn’t already know from when the classic film was released on DVD? Well…that’s the thing. Blu-ray changes everything! Of course we still watch Mowgli as he travels through the jungle on his adventure with everyone’s favorite Disney bear, Baloo – but now he is doing it in high definition! And Bagheera, the wise old panther we all know and love? He’s even wiser in high def. Well, I made that part up, but he looks wiser! If you have never seen Disney’s The Jungle Book, now is definitely the time to do it! You can explore your own wild side as you join Mowgli, Baloo and the rest of the gang as they embark on an extraordinary adventure and celebrate the true meaning of friendship! The bonus features are pretty awesome too, my favorite was the alternate ending with Mowgli and the Hunter. I am getting a little old, so maybe I just forgot it from the DVD release, but I am pretty sure it’s new! You can buy your own copy of Disney’s The Jungle Book Diamond Edition Blu-ray on Amazon for just $28.96! That’s my Amazon affiliate link, so if you decide to buy it, you can help me earn a little commission by doing so through that link! I was so excited for the release of Disney’s The Jungle Book Diamond Edition that I created a Jungle themed veggie platter for a blog campaign earlier this month. What do you think, could you see Baloo and Mowgli in there somewhere? You can catch a clip of Disney’s The Jungle Book right here! 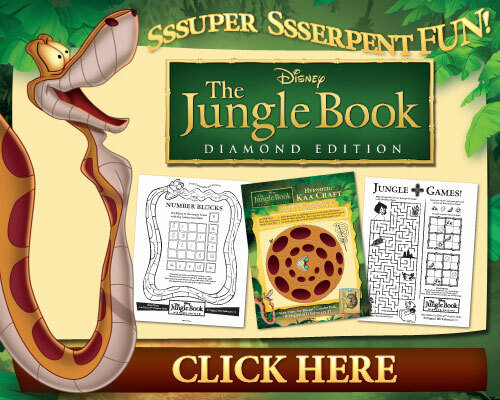 Check out these super fun and free Disney’s The Jungle Book Diamond Edition printable activity sheets! Get Social With Disney’s The Jungle Book! To learn more about Disney’s The Jungle Book, visit the Disney Jungle Book Facebook page and follow @DisneyPictures on Twitter! « Looking for a Healthier Work-Life Balance? Check out Mom Corps YOU! The veggie platter is a great idea! I loved that movie.I’ll have to pick up the DVD combo this weekend. I love the jungle book as a young kid – I hadn’t heard that this combo pack was out. I’d love to pick it up so that I can share the movie with my nieces/nephews. The Jungle Book is one of my favorites. I am so glad they decided to created a new edition. I will buy for my kids for sure. Thanks for sharing. The Jungle Book is awesome. I remember watching this with Dylan & Em when they were little and they are now 21 & 17! I think we would like it as much now as we did back then. It’s taken me 41 years to spend a few hours at Disney World! 😉 And, did I see an alligator from Gatorland sneaking around in your veggie platter?! LOL I really need to get a blu-ray player I feel like I’m missing out on the best bonus features with every new movie release. I love that you created a veggie platter to go along with the movie. I’m going to try that with my kids. I grew up with this movie and I had the book version of it also. I even later read the original. I love this story.